In a perfect world, you'd have weeks or months to pour time into research before launching new features or product updates. But reality moves much faster than that; markets shift and user needs evolve. As a result, you're forced to build and launch product iterations quickly.But just because a quick turnaround is expected doesn't mean that quality should suffer. Feedback loops are getting tighter, so users expect the same level of quality they've come to expect from you. So how exactly do you build fast to accommodate ongoing product iterations? The answer lies in how you adapt to changes. We're going to take a closer look at why it's important to build products fast, how to use data to do it, and how to consistently deliver strong products using this process. You're in business to succeed and grow. How you do that is due in part to how quickly you iterate. That's why the “build fast” mentality has to be a part of your company's makeup. In other words, you not only build quickly but also constantly. Farhan Thawar, VP of engineering at Xtreme Labs puts it this way, “It happens to the biggest names out there, but users expect to see a really quick turnaround, especially from brands they respect.” He continues, “Especially now with automatic updates, people are used to seeing constant improvements in functionality and performance." The "it" he's referring to is fast iteration. In order for your product to grow and succeed, you have to seek out opportunities and act on them quickly. Not doing so results in a lack of confidence from users and a higher chance that they'll leave. Put another way, "You need to embrace uncertainty and iterate based on new information all the time." While it's important to build and deliver quickly, it's even more important to learn quickly. Keep an ear to the ground, and constantly pay attention to what your users are saying and doing. Think of tech giants like Apple or Facebook. They release updates at breakneck speeds because they understand the value in seizing opportunities, getting in front of their competitors, and staying top of mind with users. Whether it's a new device, app, or feature, these quick builds keep users engaged and eager to come back and see something new. Put together, this is how you grow and succeed. Based on how user needs evolve or market trends or competitive innovation, fast-paced companies like Apple and Facebook are quick to learn and ship updates frequently. Stay up to date with what users are saying or asking for. You can't implement everything, but weed through the feedback to find opportunities. Rank them, and quickly act on them. Pay attention to what your competitors are doing. For example, it hasn't gone unnoticed that social media platforms are becoming more alike. A similar user base means you can learn from competitors and build quickly to stay current on trends. 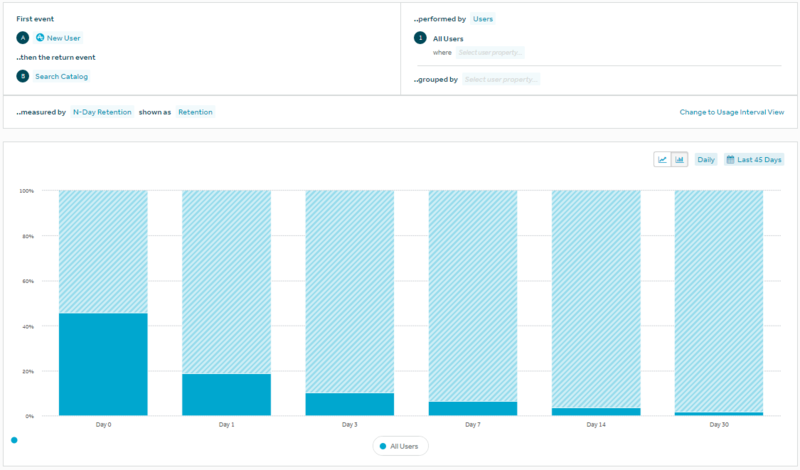 As your user database continues to grow, your product analytics will help you iterate faster and grow quickly. Once you've built up your data, it serves as a powerful source of insight. It'll tell you exactly what users are doing in your product and act as the place for you to learn from them. But here's the thing—it is a snapshot of a moment in time and won't necessarily tell you everything you need to know going forward. That's what it means to be data informed. Data is only part of the picture, and using the data you've gathered helps you understand what short-term updates users need. If you make decisions solely based on what the data says, you run the risk of missing opportunities. As you can see, there are fewer user searches on return visits. The downward trend clearly shows a gradual drop in retention, but it doesn't tell you the reason for the drop. Being the data-informed product manager that you are, this is an opportunity to find and test new features that drive higher retention. Push notifications. Perhaps users forget the benefit of frequent searches, such as access to more content. Segment users into two groups. Send some push notifications to one group but not the other. If retention creeps up as a result, you're onto something. User sharing. If users are able to share their finds with other users, it might encourage them to search more often. Again, segment users, and then run an experiment that only gives the share option to some users. If retention starts to grow as a result, run with it. Data is the first step in solving the puzzle, finding opportunities, and building solutions quickly. Running experiments and tests is the next step. It isn't uncommon for some companies to get caught up in a waiting game with users. They wait for validation of their plans with purely qualitative approaches, such as surveys, instead of using quantitative data analysis. 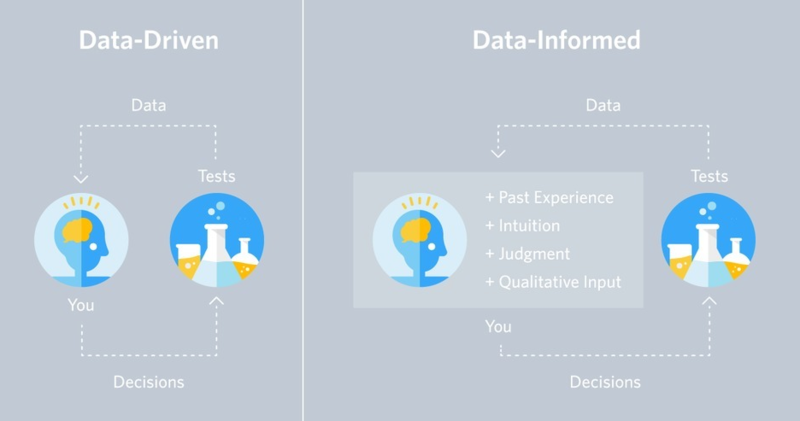 In order to build quickly, use your data to inform you decisions. Relying on it, in combination with other efforts, helps you push forward quicker and build fast. When Chris Fry was VP of development at Salesforce, their initial focus was on testing everything before launching. Of course this was time consuming, so the new approach was to restructure the engineering organization and use the data they had to make decisions. The goal was to reduce the amount of testing while increasing iteration speed. This reliance on using data to inform their decisions has allowed Salesforce to grow quickly and keep user needs front and center for every update they ship. The businesses that stand the test of time and become mainstays in their markets are the ones that have paid attention to trends and incorporated speedy iteration into their products. Whether users bring an issue to their attention, or their data uncovers opportunities, they respond quickly. Take Instacart, for example. They weren't the first to come up with the idea to deliver groceries—Webvan came first—but what set them apart was their flexibility and ability to iterate quickly. Apoorva Mehta, founder and CEO of Instacart, explains that the company is constantly testing to make sure their product is just right. So, unlike their predecessors who built quickly but without a plan, Instacart has been far more strategic in their approach to growth. For instance, they initially launched their service in fewer markets and steadily added features to the app, such as product availability, aisle navigation to find products quicker, and shopping customization. 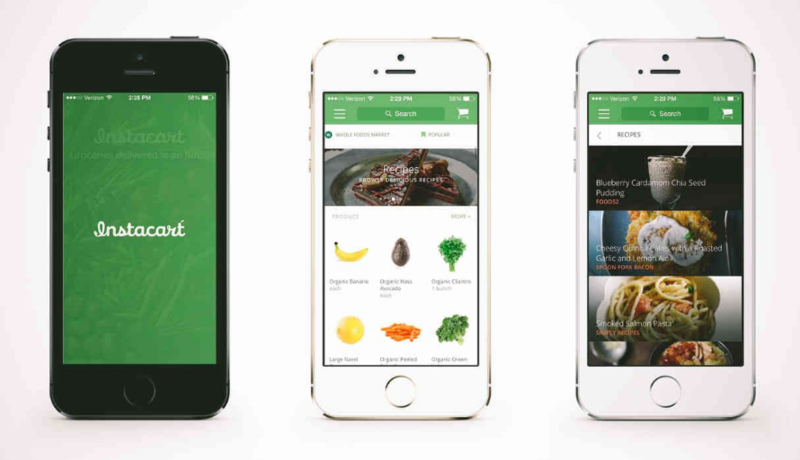 Because Instacart's number one focus is the customer experience, they're able to learn from customers and quickly implement innovation that no one else has even begun to consider. Mehta says, "There’s no one doing what we're doing—the challenges that we are solving for, and the scale at which we're doing so, have never been done before. As a result, we've had to invent the technology from scratch." It's worked for them because with these small, gradual upgrades, they grew from just one shopper to roughly 7,000 in the company's first three years. Set out a regular timeline for your builds. Pull out your road map and take a look at the milestones you want to achieve. Build in time that lets you accommodate features that need a quick turnaround. Choose a release timing schedule that allows you to keep on top of iterations. If this means weekly or monthly releases, understand that everything doesn't have to be ready all at once. Like Instacart, divide your product updates into smaller, more manageable lumps of time so that you can plan, release, wait for your feedback loop, and then build more from there. As you can see, it's vitally important to be able to build fast. By using your data as a starting point and setting small, manageable release schedules, you're in a better position to build quickly. Everything doesn't have to happen at once. Products rarely stay the same over the course of their life cycle. As new opportunities present themselves, iterate and measure. Continue to learn as you go and your iteration speed will increase at the same time. With a measured, structured approach to improving your product, there's no need for quality to drop.